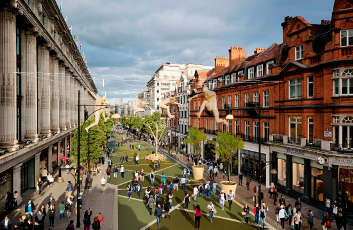 Plans to pedestrianise part of Oxford Street have been backed by a majority of the 22,000 people who responded to the latest consultation but the authorities have pledged to look at issues of safety and accessibility raised by the public. The proposals put forward by Westminster City Council and Transport for London (TfL) involve a new traffic-free area between Orchard Street and Oxford Circus by December to coincide with the launch of Elizabeth Line (Crossrail) services. TfL said the aspiration behind the changes is the creation of ‘safe, accessible and inspiring public spaces for people of all ages to enjoy’, to rival those in other world cities such as Paris and New York. More than 22,000 responses to the second consultation on the plans were received. Of those who responded to the online consultation directly, 64% supported all or some of the plans to transform the area.Thirty-three per cent of those who responded to the online consultation did not support the plans. TfL also received around 7,000 written responses as part of a Living Streets campaign supporting the scheme, and a further 632 written responses as part of a local campaign against the proposal. Issues raised in the consultation include traffic and air quality on residential roads, provision of a safe cycle route through the wider area, management of the public space and ensuring that Oxford Street remains accessible for all. TfL and Westminster City Council are now considering ‘every one’ of the issues raised before the council takes any further decision on how to proceed. Alex Williams, director of city planning at TfL, said: ‘The introduction of the Elizabeth line later this year will significantly increase the number of people walking along Oxford Street and this creates a once in a lifetime opportunity to transform the area into an unrivalled place to live, visit and work.